I have so much oregano in my garden right now, I really don’t know what to do with it. You know I hate wasting food, especially something that I put so much effort into growing (ok the extent of effort with this was literally digging a hole and covering it up again…but still). So I was hunting for some recipes using fresh oregano, when I had a little bit of an ‘a-ha moment‘ and decided to use it up like I did my excess fennel, and whip up a fun pesto. It’s grilling season, and Mediterranean flavors coming from the grill and being enjoyed in some nice hot weather = just perfect! So we cut down a whole trees worth of oregano and got to pesto testing. The result is fantastic, and it freezes well too, so you can pop a couple batches in the freezer and enjoy that fresh zesty oregano flavor all year round. Although, if your oregano is as crazy as mine, you will have the fresh stuff all year round anyway, but it’s always nice to have something pre-prepared, right? How Do I Serve Up Oregano Pesto? freshen up some chicken skewers. If you try it and love it, be sure to pop back and leave a comment. Also, if you have any other ideas on how to use up lots of oregano make sure to leave those in the comments as well, so everyone can benefit 🙂 Happy eating. Add all ingredients but the olive oil to the bowl of a food processor and grind until the mixture is slightly combined. With the processor still running, slowly stream in the olive oil until the mixture becomes smooth. I usually freeze my pesto in ice cube trays. Just pop the mixture into the ice cube tray, freeze, and once frozen remove and store in a ziploc bag until needed. How long will this pesto last in the refrigerator, if I didn’t want to freeze it? I can’t wait to try this recipe! Hey Jennifer, it should last for 5-7 days in the fridge. I always try to use up within a week and then transfer to the freezer. Enjoy! Awww… thanks for including a link to my potatoes!!! 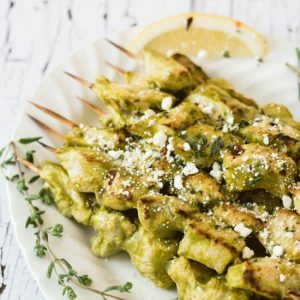 This post came at just the right time – my oregano plants are going gangbusters so this pesto is right up my alley – brilliant!!!! Oregano just goes crazy doesn’t it! I am always looking for ways to use up the extras, and these potatoes were delish! Hey Janelle, I use the whole raw almond in this, but the slivered variety would work just as well if that’s what you have on hand. Works amazing with my favourite pasta recipe: wholegrain penne cooked al denté, tossed in pesto and topped with raw red bell pepper, smoked salmon and feta cheese. So the thing about oregano is that it is a really powerful flavor when it’s fresh… sometimes too much. But in a pesto, the flavor is supposed to be bold. I can picture this on grilled chicken, fish and even a good steak. Lovely photos! Oh yes, it is a bold pesto, but a little goes a LONG way. I have been pairing this one with grilled chicken and topping with some feta and it works SO well!